Star Trek: Discovery was one of my most anticipated tv shows of 2017. As the show was nearing the premiere, details started to leak. If I am honest, the details were one disappointment after another. First, the show is set before Captain Kirks Enterprise but after Johnathan Archers Enterprise. I thought to myself “do the writers have any creativity at all?” Seriously, more Klingons, Vulcans, etc., etc.? Snooze. Second, I was disappointed in the casting of Sonequa Martin-Green as the lead character. I didn’t care for Sonequa in the Walking Dead. It is hard to know if it was Sonequa’s acting or just the Sasha character. Either way, my official review is, blah. It wasn’t the Walking Dead which turned me off Sonequa; it was Rhonda on Fox’s New Girl. Sonequa EXPERTLY plays Rhonda. So much so she is typecast in my brain. Whenever I see her in anything else, I wait for her to yell “You got Rhonda’d!” I wait for it every episode of Discovery. Third, the trailers and previews were awful. Did the producers even want anyone to watch the show? And what’s the deal with shooting it in 2k? Horrible decisions. 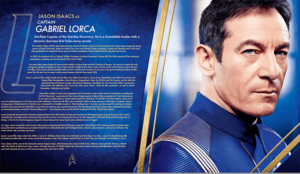 Fourth, CBS All Access. CBS All Access may be the worst streaming service ever created. Not only does CBS not support 4k but it also steams is 2.0 STEREO! It makes me want to cry how crappy Discovery sounds. The voices and sound effects are mixed and muddled. You have to crank up the volume to even hear what people are saying and when explosions hit it is so loud you feel it in your soul. On top of it all, CBS wants me to pay AND show me commercials. I’m a dummy and oped for the commercial-free $9.99 per month. I just can’t give them money and watch the commercials. I will be canceling the very second Discovery is over. The fact CBS prices and believes the value of CBS All-Access even comes close to Netflix is delusional at best. Fortunately or unfortunately my ability to resist Star Trek of any kind was futile. Unlike my inability to resist Oreo’s I have no regrets. Star Trek: Discovery is excellent. It is on track to be as good as TNG. It is already better than DS9 and on par with Voyager. I don’t compare anything to the Original Series. 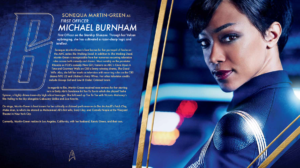 I am delighted with the Michael Burnham character played by Sonequa Martin-Green. I’m still waiting to be Rhonda’d although its less and less every episode. The way Sonequa threads the fine line between maintaining control of her emotions while trying to embrace her humanity juxtaposes Leonard Nimoy’s Spock. The internal torment of logic, right and wrong feel very St ar Trek. The rest of the cast is equally good. 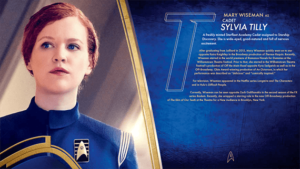 Special kudos go to Jason Isaacs (Captain Lorca) and Mary Wiseman (Sylvia Tilly). The timeline is also way more interesting than anticipated. I expected a Star Trek: Enterprise experience where the problems faced would be easy with technology from the original Enterprise and frustrating because they don’t have access to it. There is a reason most prequels stink, we already know the future. Writers found a way around the technology issue by inventing something we haven’t seen before, the spore drive. I have not seen the spore drive in anything I’ve ever read or watched. As far as I can tell it is an original idea. Bravo. I’m a little worried about how the Discovery interacts with the Star Trek universe. Since none of the future ships jump around on the mycelial plane, we are left to conclude that the drive was a failure and forgotten in history. Even though there are many reasons to avoid watching Star Trek: Discovery I believe it is the best show on TV. It is a significant endorsement considering TV has been exceptionally good the last few years. Yes, Discovery is better than the Walking Dead, Orville, Dr. Who, Flash, Agents of Shield, etc. As for CBS All Access, I suggest nominating a friend with a 4k apple tv (it upconverts) and getting together every Sunday for a Disco viewing party. Make it social, and it is not only more affordable but more enjoyable.